The concept of creating shamanic art includes having many people creating it together. The effort of the group magnifies the power of the creation beyond the number of people working on the project. Lauren asked us to decide, as a group, what we wanted to manifest in the world. We decided unanimously to project an image that would increase the respect for the Divine Feminine in the world, especially in areas where it is lacking. First, we gathered together and rattled and drummed to find the images and symbols to be used for this purpose. 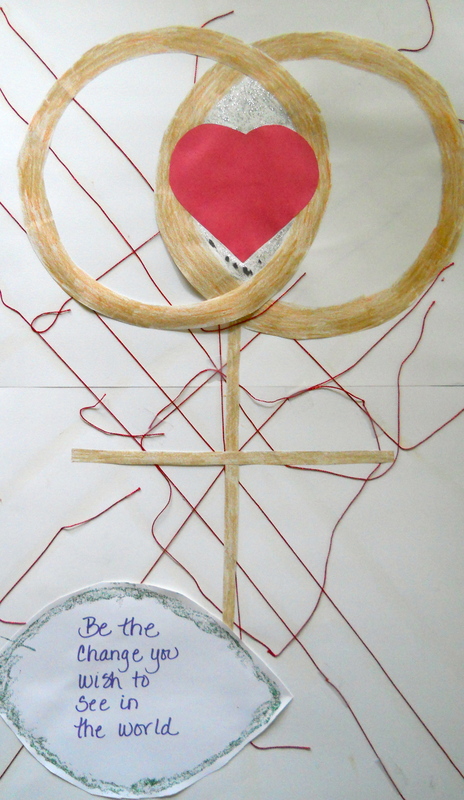 After a while we decided to use the circular symbol with a cross on the bottom to signify the feminine; a heart as a symbol of love; a mirror so that everyone would see the Divine Feminine within themselves; a web signifying the interconnectedness of life and the saying “Be the change you wish to see in the world”. We worked as a group, using the art materials we had on hand to create the final symbol. This was a pleasant exercise; everyone helped; everyone had suggestions; everyone agreed on what we needed. After we were through, we used our rattles together to find the spark of divine light that would carry the energy of our symbol and would expand it until, like a meteor, it would burst forth into the world. Once we found it individually we started toning (making a single note sound). After we were all toning, we each focused the symbol to send it forth into the world. We pictured our collage expanding and covering the entire world. Afterwards we gave each other hugs. We all had a great feeling of peace as the seminar came to a close. I was voted custodian of the collage. It is pictured below. Blessings to all who view it! Very nice, Paul. Where is this piece of art now? It resides in my ‘personal art collection” – at home. it’s constructed of paper, thread and some glitter.